The Inman Aligner is a wonderful tool available to patients that will quickly and efficiently correct misalignments of front teeth of the upper and lower jaws by applying gentle pressures to the teeth, thereby moving them into a harmonious alignment that is more aesthetic and pleasing to look at and makes your smile much more attractive. All this can be done, not in months as with standard orthodontics, but in just a few weeks. You can go from having a crooked smile to a beautiful smile in as little as 3-4 weeks. Why do the front teeth become crooked? 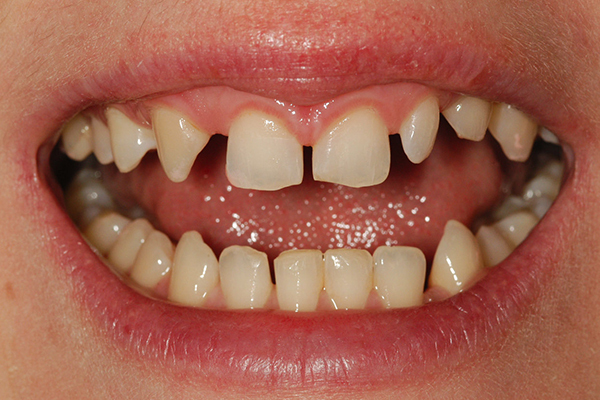 Many patients suffer from crooked front teeth even if they have had orthodontics as youngsters. Over time the natural process of forward migration of teeth created sufficient pressure on the front teeth to have them buckle and shift. If this is you, and if nothing is done to alter this state, it will slowly and progressively continue to worsen making your smile less and less attractive. In many cases the front teeth overlap, some pushing to the front and others backward. There may also be some tooth rotation of these teeth in the process of pushing forward or backward. Then, suddenly one day, you look at a photo and realize your teeth and your smile does not look good at all. This misalignment is seen more frequently on the lower front teeth but occurs on the upper, maxillary, anterior teeth also. In fact the lower teeth are often the reason the upper teeth may look worn, chipped or crooked because a normally functioning chewing arrangement does not exist and excessive forces from below damage the upper teeth. What is an Inman Aligner (IA)? The Inman Aligner is a low intensity orthodontic device created specifically to deal with the very common problem of crowded, out of position, front teeth (central and lateral incisors, canines (cuspids)). It is capable of reestablishing a harmonious realignment of the front six teeth in just a matter of weeks. How does the IA Work? What Can the IA do? What can an IA NOT do? How long does treatment take and how much does it cost? What happens to the damaged teeth after using the IA? How long will the teeth stay in position? What is considered a ‘Normal Anterior Bite’? The IA moves teeth by applying simple vector (directed forces) physics to the teeth. Through specific points of pressure the teeth are guided into a balanced position, mostly with forward or backward pressure. Think of it this way. If you push on the front or back of a person in the center of the body, they will move straight back or forward. If you push on a shoulder, you will rotate them. By carefully selecting the exact points of contact in the front and back of teeth, the teeth are moved carefully into position. 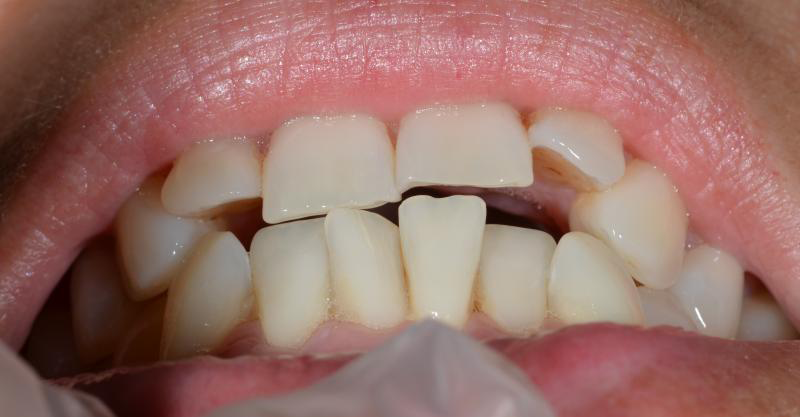 Once the movement is completed to your satisfaction a retainer is used to maintain the position. A retainer will be a part of your life going forward. In fact, if you had childhood orthodontics and had it been worn routinely up to this point, you likely would not have needed to redo your treatment. IA is a removable appliance so it can be taken out for brief periods of time as circumstances dictate (social functions, eating, athletics). To be effective it must be worn a minimum of 20 hours a day. 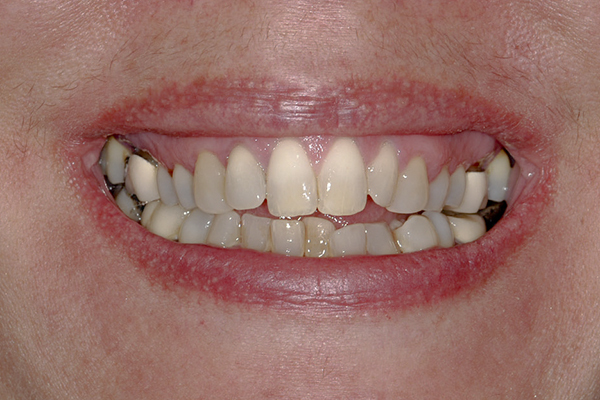 The Inman Aligner was designed to straighten out irregularities in the front six teeth of adults as a result of being pushed forward, backward or rotated slightly by quickly and affordably arranging the front teeth so they function properly and look harmonious for a better working and looking smile. The entire process is done through computer analysis so the process eliminates guesswork, creating the best possible result. In the more severe cases of crowding that an IA can handle an ideal position may not be possible to achieve, but the result will be significantly better in appearance and function. It will not affect any other teeth in the mouth except for the front teeth. It will not push teeth down into the bone; it can pull straight up/down slightly. It cannot move teeth laterally except by tipping that occurs from a forward or backward pushing which engages an adjacent tooth and slightly tilts it. 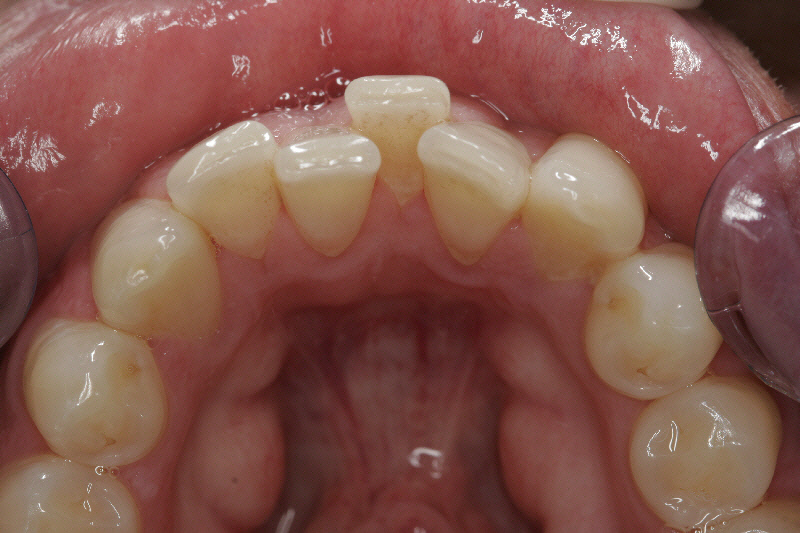 It cannot treat severe anterior tooth displacement. These cases are best handled with orthodontics (see orthodontics in cosmetic dentistry-link). It cannot treat children or adolescents who do not have full adult dentition and completed jaw growth. Realize the Inman Aligner is a localized application of forces on teeth and while it can do wonderful aesthetic things for a smile, it cannot do major orthodontic processes for anterior teeth. Because the treatment is all computer driven, it will diagnose, analyze and program the course of action to be taken down to the finest detail, as well as eliminate cases that are inappropriate for IA and should be handled by regular orthodontics. IA does not bodily move teeth through bone as with full orthodontics as much as it tilts teeth back/forward toward a more ideal position. Thus the limits to its function. Besides pushing forward and backward, the IA can extrude (pull) a tooth down (upper teeth) or up (lower teeth) to a small degree. Fortunately this covers most of the problems of front tooth crowding. Functional misalignments beyond the scope of the IA are better handled by full orthodontic treatment. In reality very few people, including movie stars and other celebrities whose smiles we idolize, have perfectly straight teeth and perfectly balanced smiles yet they are beautiful to look at and we readily accept their imperfection. Perfection rarely occurs in nature, but if you so choose you can achieve it at our dental office with properly designed and completed treatment plans. These are the two best features of the IA. 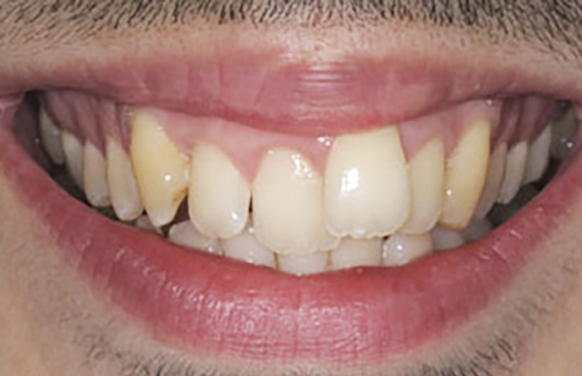 The course of treatment from the easiest to more challenging cases is between 4-13 weeks . Worst case scenarios may take up to 16 weeks, but that is a far faster treatment span than with routine orthodontics. Again, the IA works within a limited perspective of dental alignment issues and does not tackle major orthodontic misalignments, even in the front of the mouth. The computer analysis will determine if your teeth are appropriate for IA. As a result the fees for IA therapy are a fraction of that for routine orthodontics. Every case is unique but, as an example, the least involved cases only cost between $1,200-$1,500. Any dental insurance coverage may also affect your out of pocket fees. What happens to any damaged teeth after using the IA? In addition to the IA treatment there may be need for further cosmetic enhancements including porcelain veneers. When discussing such treatments with my patients this is what I refer to as “The Next Worst Case Syndrome”. In dental speak that means that after IA the teeth will look better at first because they are straight, and that one glaring front tooth out of position that you initially focused on was the only blemish could see every time you saw your face in the mirror. What your eyes may not have also seen was the chip on the corner of another tooth or the discoloration of yet another. In the end each patient will decide for themselves what needs correcting but it is a natural instinct to want to fix up the smile so it looks harmonious and balanced, a true glamorous smile. You want your smile to match your style. These add on procedures can be discussed in the beginning before IA treatment starts, and you can know all the bundled costs before you begin. Dr. Prus will guide you in this decision making process. This is a most important question. The teeth will stay in the position you put them as long as you regularly use a retainer. Dentists now agree a retainer is a lifetime requirement. In years past dentists used to think that patients only had to use retainers until the ‘memory’ was eliminated in the bone (bone really does have a type of elastic memory), perhaps a few years at most; not any more. As stated above, teeth are always on the move toward the front of the mouth. A retainer prevents that from happening. A normal anterior bite functions this way: when the lower jaw moves forward the lower teeth should strike and slide down the back (palatal) side of the upper teeth. That functional relationship is called incisal guidance. It should be smooth in transition between each tooth. When lateral movements are brought in, the same process should continue smoothly, transferring the biting forces evenly from tooth to tooth. When the lower jaw moves strongly to the left or right, in most mouths the canine (cuspid) teeth are contacted on the palatal surface and they will ‘open’ the bite because of their length (try sliding the lower jaw left or right with the teeth in contact while looking in the mirror and you will understand). In adjusting incisal guidance a dentist will put marking (articulator) paper between the upper and lower teeth and observe the marks left on the teeth when the jaw functions as above. The marks should be evenly distributed. If not, selective grinding of the tooth surface, ‘occlusal adjustments’, are made to make it more balanced. When teeth are crooked and out of place and occlusal adjustments are not sufficient to correct the bad bite, tooth movement is appropriate. The adverse forces of teeth grinding improperly wear down the contacting surfaces causing visible attrition and damaging the smile. Any and all cosmetic based services including an Inman Aligner are available to correct this.